Garlic may well be the key to eternal life. It has been known to remedy many illnesses due to its antiseptic properties and there is even some evidence that it can stop you getting food poisoning or even MRSA. And it tastes well good too. The guys at The Garlic Farm take time each week to leave their idyllic Isle of Wight hideaway, with its café, shop and cooking classes, to come over to Ally Pally and sell their wonderful pickles and condiments to the poor, fresh air deprived city dwellers of north London. We are entirely grateful. They sell every conceivable garlic related product, including; Hot Garlic Pickle, Tomato Garlic and Ginger Chutney and Horseradish Mustard with Garlic. They will make your lunch taste exceptional and give you the kick of health and vitality needed in the darker months. Their stall was very busy, with lots of people gathered round to try the different flavours with a little bit of cracker. If you are really serious about garlic, you should check out their website with its endless cooking suggestions, garlic facts and extensive shop. The more casual garlic fan may be happy just picking up some sauces once a week. On the website, they claim to have found traces of life on their farm dating back 8,000 years, so it is fair to say that they have history. What better way of building on that heritage and roots than producing a healthy, tasty and fun range of products and bringing them to the masses. You can find them at the Farmer's Market at Ally Pally every Sunday. Why? 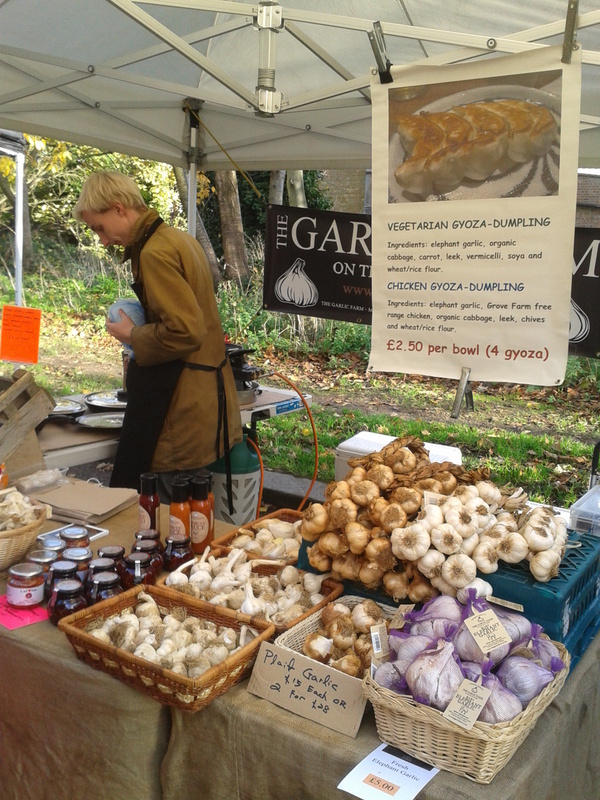 Get a garlic fix in north London.